Tactile play | Children's development | KaBOOM! If you've ever watched your toddler stick his hand right into a bowl of Jello, you know one of the first ways children explore and learn about their world is through touch. Playtime is also a lot more fun when toys have diverse textures for kids to rub their hands and bodies against. To encourage active learning, include toys and structures with a variety of surfaces in your playspace. In fact, many objects in your playspace can incorporate a tactile experience. The surface might be soft carpet in one area and rubber pour-in-place in another. Blocks might be wooden, soft and fuzzy, or even squishy. Ask children to describe the feel of different objects to you, make comparisons, and share preferences. Children with special needs, in particular, can benefit from play that stimulates their sense of touch. For children with visual or auditory impairments, tactile play with manipulatives (blocks, LEGOs) and fingerpaints might be easier to master and enjoy. 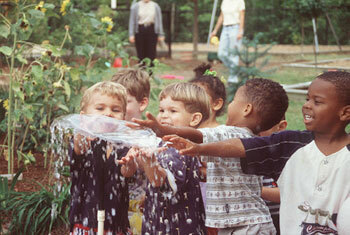 Children who are easily over-stimulated might find water play especially soothing. Children love to touch their world, so be sure to provide them with areas through out your playspace that allow them a rich variety of things to touch.